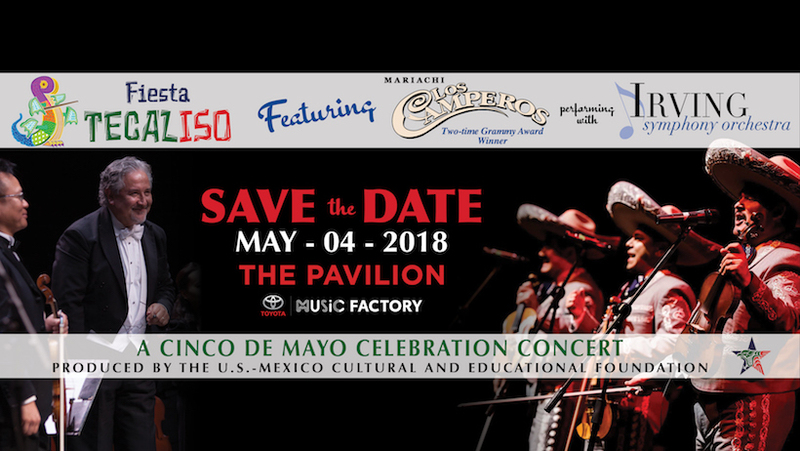 World renowned Mariachi Los Camperos and the superb Irving Symphony Orchestra come together at Irving’s The Pavilion at Toyota Music Factory, Friday, May 4 at 8:00 p.m. for a captivating Fiesta Tecaliso: A Cinco de Mayo Celebration Concert. The concert is produced by the United States-Mexico Cultural and Educational Foundation in collaboration with Live Nation and the City of Irving. Fiesta Tecaliso is a unique pairing of Mariachi music and classical music. Led by Maestro Hector Guzman; music director for the Irving Symphony Orchestra, the ensemble will thrill mariachi and classical music enthusiasts alike in an evening of musical virtuosity. Two-time Grammy Award winner, Mariachi Los Camperos originated in 1961 and was founded by Natividad “Nati” Cano. Cano played a fundamental role in the development of mariachi music in the U.S. by training and mentoring new generations of mariachi musicians. Mariachi Los Camperos has recorded nine albums, achieved multiple Grammy nominations and delighted audiences around the world. The Irving Symphony also began in 1961 as a small group of musicians, and in 1963 became the Irving Symphony Orchestra. In 1988 the orchestra transitioned from being a community orchestra into a full-fledged professional symphony association. In 1991 Maestro Hector Guzman became the Music Director/Conductor of the Irving Symphony, further elevating the Irving Symphony’s status among regional symphonic organizations. Maestro Guzman is also the music director/maestro for the Plano Symphony Orchestra, Corpus Christi Symphony Orchestra and the San Angelo Symphony Orchestra as well as “Conductor Emeritus” of the Jalisco Philharmonic in Mexico. He has guest conducted in the U.S., Mexico, Japan, Italy, Dominican Republic, Korea, Poland and Spain. The name Tecaliso derives from the region in Mexico where Mariachi music was born, Tecalitlan, and the abbreviation of the Irving Symphony Orchestra (ISO). This is a concert experience you don't want to miss! Purchase your tickets today!